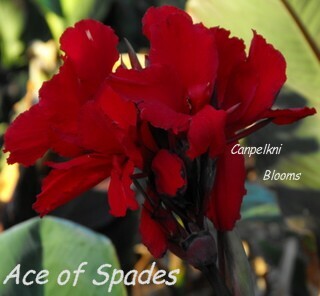 Canna Ace of Spades is one of the darkest of the red cannas that I grow. When the dark blackish red flowers appear they are quite a sight to behold, they open from dark blackish colored buds also. 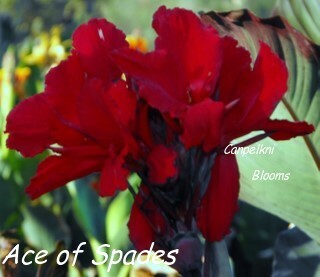 This is a short to medium growing canna reaching up to 1.2 meters tall when in flower. The foliage on these canna plants is green with a dark burgundy colored margin. This burgundy coloring also carries back onto the leaf over lapping the margin, and the stems on this cultivar are colored a dark burgundy also. 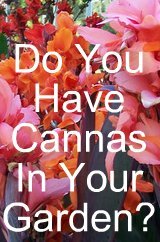 Because it’s one of the shorter growing cannas its perfect for the front of a Perennial border or as a potted plant on your balcony or patio. Where ever this is grown the unusual colored flowers are sure to catch the eye.